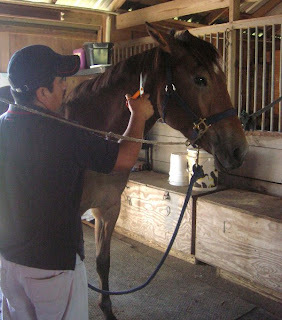 Today I took Ozzie to get his mane pulled. Ozzie has this really thick and frizzy mane. I have been dying to get his mane pulled. I can pull manes, but it takes me forever. The purpose of pulling Ozzie's mane is to get it shorter and thinner. Eventually I want it really thin so braiding or banding will be quick, easy, and uniform. I got to the barn at 10 am. Leo was cleaning a stall. Leo is the wonderful Mexican man that works at the barn. He used to work for some Olympic jumper and now works for this barn. Michael, the trainer, put Ozzie in the cross ties and Leo went to work at about 10:15 am. By 10:30 Ozzie was finished. I was awe struck. I couldn't believe it. That job would have taken me hours and probably two days because my fingers would have been killing me. I use a mane pulling comb, but still you can't help getting tired. This is Ozzie before. "Who me? I don't need a hair cut?" His long puffy mane. It actually looks kinda tame in this picture, but that is because half of his mane is on the other side. For a three year old, Ozzie has a lot of mane. I couldn't even get my camera out fast enough to take pictures of Leo pulling Ozzie's mane. He really did it that fast. Leo was just trimming up the edges when I returned from my truck with my camera. Just look at that pretty mane. All neat and short. I think Ozzie looks like a baby now. Just look at all that mane! That is a lot. 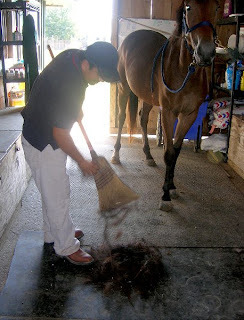 I am still in shock at how quickly he pulled all that hair out of my horses neck. Leo cleaned up his mess and then went back to cleaning his stalls. As if it was nothing. Just an every day thing. 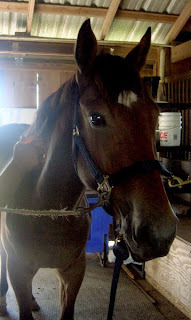 Clean a stall, pull horse's mane, clean another stall. Leo is a wonderful worker. Oh, he also told me that he couldn't believe Ozzie was so well behaved for a three year old. That made me feel good. 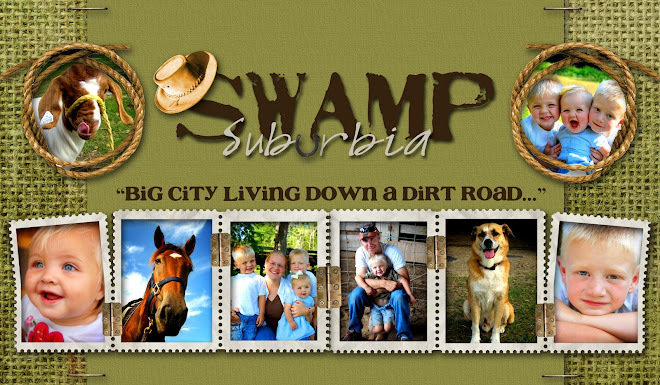 The poor guy has to deal with all the crazy Selle Francis warmbloods that they have there. They aren't all crazy, but they are all mostly 5 and under. So, they are young and spirited. Mostly because they are jumpers. They have a bunch of weanlings and yearlings too. And Ozzie is really mellow by nature. I lucked out with him. I think Ozzie likes his new do. I need to braid it so it stays all on one side. 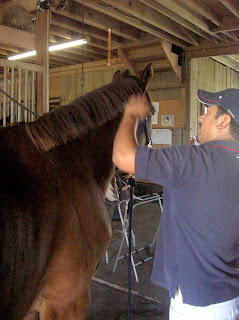 Now one thing that Michael, the trainer, said was, "Braid his mane to the right side." I guess he likes the mane to fall on the right side. I have always thought that it didn't matter. Maybe western people don't care. But even still I thought you wanted it on the left side. Boy, have I been wrong all this time and not ever known it? 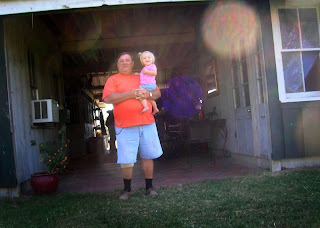 But while I was writing the check and singing praises to Leo, Little Cowpoke took a picture of Paw Paw and Cowpokette. Cowpokette loves her Paw Paw. I think she kinda looks like him. It's funny how much she looks like that side of the family. Oh, and she took five steps today. She might start walking after all. I was beginning to think she might crawl forever. She was so excited. Cowpokette screamed so loud. Girls, they are so different from boys. Girls are definitely different than boys. And they only get more different as they age. Have fun! Ozzie looks great. Ozzie looks great! Such a handsome boy! I like ours to be on the right side! 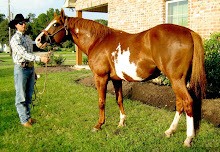 Hubby's horse half is on the left and half is on the right. I try and keep the part going to the left braided to the right side and it seems to be working! Woo Hoo! Cowpokette is a cutie! Ya on walking! WOW. What a skill to have!!! Flipping amazing! And he did such a nice job too. Your kids are just too darn cute Andrea! Yay! She finally decided walking is fun! Fun for her, trouble for you, right? Hope your in good shape for running after her. Once they start walking running isn't too far behind. Ozzie looks great with his shorter mane. 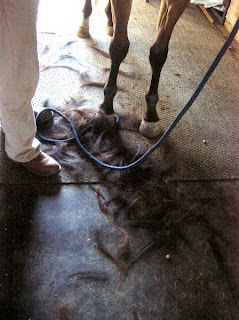 I can't believe how fast Leo was, it takes me forever to get a mane pulled. That's so funny you all pull your mains there...the most we'll do is roach them if they rub it bad, but other that that we want to see a long flowing mane in the arena here! No bridal paths either IF it falls nicely. Of course, those who have problem manes do pull them, but it's something we look for at the sale even! Your baby girl is cuter with every picture! I prefer long manes but Ozzie looks great ! And...you didn't have to do it yourself ! 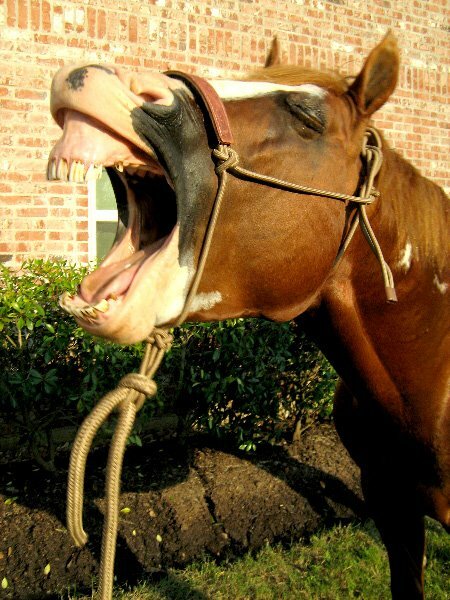 Does that hurt the horse? That sound painful. "pulling". YAY for little girlies walking! Wow. Pulling sounds so painful. I've seen horses with pulled manes, but I prefer longer manes myself. How much does one charge for doing a mane pull? Congrats for those 5 steps Cowpokette! My daughter didn't walk until she was almost 15 months old. Holy cow-I have never in my life known anyone who could pull a mane that fast. Leo is amazing. Ozzie looks very professional now-LOL. Tell him it is time to stop with the "baby fits" and get to work on becoming that WP horse you want him to be!! As far as the side the mane goes on-we have always prefer ours to lay on the left side too. 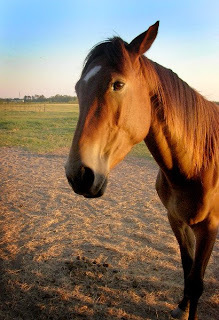 I was raised that way-because ropers around here want their horses manes on the left side. My step-dad was a stickler about it. He would roach a mane just to train it to lay on the left hand side. Of course, the younger guys don't care anymore-they just braid them to keep them out of the way. I suppose things change over time, as with anything. I heard roached manes were coming back in? Oh god, I remember those days. I don't think that is a trend I will be following again. I'm a bit floored, too. Fifteen minutes to do that?! Wow, I'm a 2-day-er myself with a mane like that. I like a longmane too. Do you "pull" it to keep it more clean looking? He is a handsome boy. Your daughter is so adorable, I just want to "squeeze those cheeks! Yay to steps! I always thought my kiddos were happier once they could start walking--crawling lasts a little long.